Stunning Postcard Views! Oceanfront Premium Kaanapali 1BR/1BA Special 4/28-5/3!! 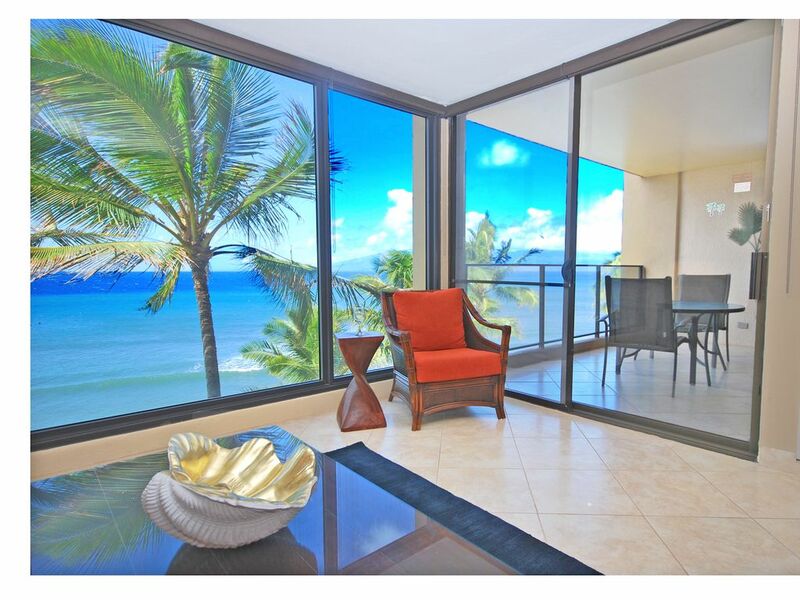 Our beautiful PREMIUM recently remodeled one bedroom, one bathroom suite is directly on north Kaanapali Beach and has incredible panoramic views of the Pacific overlooking the islands of Lanai and Molokai from its floor to ceiling windows and lanai! The ocean is literally a few yards in front of you! It has too many features to list: Quartzite countertops in the open floor concept; new stainless steel appliances and furniture, LED lighting, and FREE WIFI NO RESORT FEES! FREE PARKING! FABULOUS BBQ AREA! The beautifully professionally decorated, fully air conditioned unit is unit 604 on the 6th floor where magnificent sunsets and whale watching can be experienced from the lanai off of the bedroom and living room, or from the living room. The Mahana Resort is a well known upscale resort located on world famous Kaanapali Beach. The spacious master bedroom offers a king-size bed, cable hi definition TV and above all, an OCEANFRONT view, which is not found in many bedrooms on Maui. In the living room, there is also hi def LED TV and of course, an incredible direct OCEANFRONT view. There is free wireless internet in the condo; it is also available in the lobby and around the pool and jacuzzi areai! Our condo is perfect for 2 guests. Within minutes you can find a variety of restaurants, as well as stores for souvenirs, diving and swimming accessories, art, videos, and groceries. A short drive away is the town of Lahaina and golfing. We have been serving our guests on Maui since 1998 and look forward to serving you! The Mahana Resort is a nonsmoking resort including inside units and on lanais except in designated areas according to Hawaii State Law. PLEASE NOTE: Before making a reservation, please recognize that we book our units back-to-back where guests arrive in the afternoon of the same day in which the previous guests depart. If a guest chooses dates that are not back-to-back, then our goal is to leave a seven night space between bookings since that is what most people request. For example, please do not book 5 nights in the middle of 12 open nights or else we will be forced to reject it. PLEASE INQUIRE WITH US IF YOU HAVE ANY QUESTIONS BEFORE HITTING THE BOOK IT NOW BUTTON. There are certainly times where we will accept a reservation which leaves a small gap with other reservations, but would like to discuss this with you before you book. There are NO amenity or resort fees. We pay all credit card fees except for additional international card fees. There is usually a 5 night minimum unless requested dates do not fit into our booking schedule-please also inquire with questions about this rather than hitting the Book It Now button..
OUR CANCELLATION POLICY: FULL REFUND MINUS CREDIT CARD FEE IF CANCELED MORE THAN 60 DAYS BEFORE ARRIVAL. SEE RENTAL AGREEMENT FOR FULL CANCELLATION POLICIES. In coming to Maui since 1984 for our vacations, our family had the opportunity of staying in many of the resorts in West Maui. What attracted us to this particular area was the upscale resort and its peaceful setting, beautiful uncrowded beaches allowing long walks, water sports, and incredible views of the Pacific and the islands of Lanai and Molokai. Our family was also attracted to its proximity to many restaurants and shops, many within walking distance. Our children especially loved the beach and the many activities of the resort including the pool and jacuzzi. We were particularly attracted to this unit since it was one of the few one bedroom condos we found on the island with both the living room and bedroom being oceanfront with floor to ceiling windows providing the best of oceanfront views. It was also larger than average which was great for our entire family. Our direct oceanfront location in North Kaanapali Beach is truly stunning offering views of the Pacific with Lanai to the south and Molokai to the north. The 6th floor location allows for wonderful whale watching and beautiful sunsets whether you are on the balcony or sitting in the living room from the floor to ceiling windows. The resort amenities are for all ages, including the tennis courts, swimming pool, jacuzzi, and saunas. Kaanapali Beach is uncrowded and offers great water sports including snorkeling, swimming and even surfing. Sunning and strolling along the beach or even along the new boardwalk that extends down towards Black Rock are popular. The location of the resort is within walking distance to many restaurants and shopping, and is a short drive away to many more as well as world class snorkeling and golfing. Beautiful upscale Mahana Resort is one of the most highly rated resorts in all of Maui, the #1 ranked island in the world by many! Located right on beach! Great whale watching during whaling season. We are not just 'ocean view', we are oceanfront!! We are located right on the beach, steps from the Pacific Ocean! Linens provided for 2 guests. Free wireless internet service provided in condo; also around pool and in lobby area. Completely remodeled spectacular kitchen. Has stainless steel appliances, toaster, blender, coffee maker, and complete service. A variety of books left by previous guests as well as a CD guide for your trip to Hana. Direct Oceanfront on the north end of world famous Kaanapali Beach. Pacific is 30 feet in front of the building for swimming, surfing, snorkeling, whale and dolphin watching in season. Free parking, free hi-speed internet access, tennis; very convenient location to shopping, restaurants, entertainment, activities, historic Lahaina, and golfing. Conditions of the beach and ocean are constantly changing and since they are subject to the wind, weather, tides, phases of the moon, storms, seasons, and other factors, no guarantees can be given. We just finished up our 2 week stay (March 2-16). The views from the condo are stunning. Exactly like how the picture shows. The whales were active during our stay and we enjoyed watching them everyday right from the condo or our lanai. The condo complex was really quiet,the loudest sound were the waves! It was a wonderful place to unplug and unwind. This condo was beyond perfect in every way! The view was so unbelievable and breathtaking, great location, supermarket and food close by, super nice owners and beach access. We really liked that the Mahana was located off the main road but in walking distance of anything we needed. We definitely will be coming back and staying at this location and hopefully this condo. It was nicely finished inside with newer appliances and a comfortable bed. The view of as amazing. Would definitely recommend #604 to anyone looking to take a trip to Maui. We look forward to staying here again. My husband and I spent a far too short 8 days in this beautiful condo. From the moment we walked through the door we felt at home. The super responsive owners have thought of everything to make staying in this accommodation a wonderful and relaxing experience. Great property. It was clean and on the ocean. Only thing, that, the TV in the bad room did not work at all and the one in the living room worked for two days and then lost signal. I called the TV cable company, they sent the man but he couldn't get in because we were not there to authorize the entry to the condo. This being a privately owned, the reception couldn't let him in. So, we just told the owner of the condo to just forget about it. Right on the beach location! Beautifully landscaped in a classic peaceful Hawaiian theme with tennis court. Free parking and high speed internet access in condo, lobby and around pool. A very wide range of activities within a short distance of the condo. Includes: extensive shopping, restaurants, snorkeling/scuba diving, Whaling Museum, Whaler's Village, Oceanography & Aquarium Center, submarine ride, golfing, and historical Lahaina.